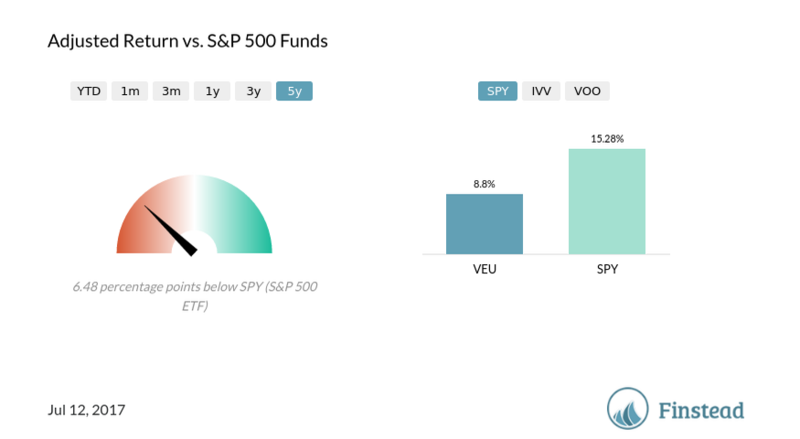 In this review, we’ll take a look at the fund performance (share–not stock–historical price, return, dividends, yield, holdings / composition, cost / expense ratio, tax efficiency and beta), and the alternatives (VXUS vs. VEU, VXUS vs. VEA, VXUS vs. VGTSX, VXUS vs. VTIAX, VXUS vs. SCHF, VXUS vs. VT) available to individual investors. 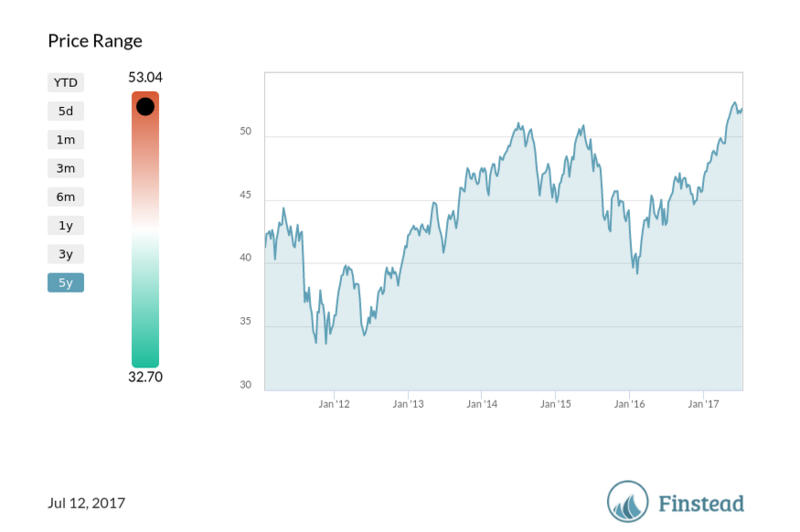 A word of caution–a triple green doesn’t mean you should invest in the fund now. It has to be right for you, given your investment goals. Also, we have no idea what the future will look like for VXUS (or international markets)–and whether international stocks are overvalued at this point. The one-year tax-cost ratio (return reduction because of taxes investors pay on distributions) for VXUS is 0.87%. That means that because of dividend taxes, returns are effectively reduced by almost one percent. VEU Vanguard FTSE All-World ex-US ETF; it focuses on both developed and emergingmarkets and has 0.11% expense ratio. VEU has 2,500+ holdings. 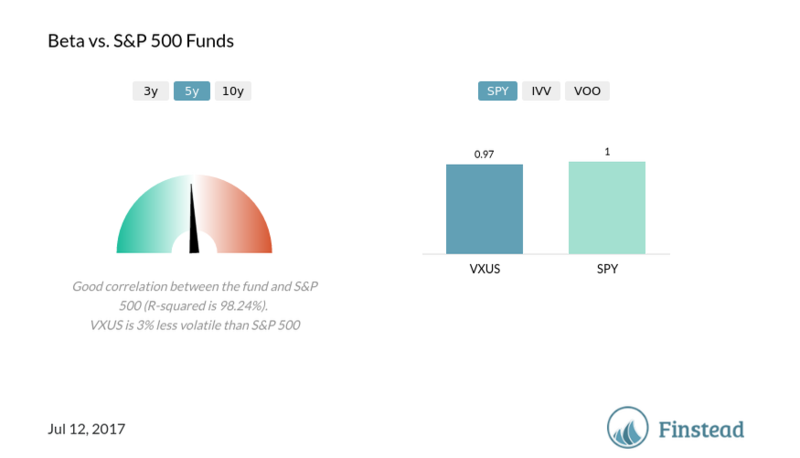 The choice is really up to you–VXUS gives you a broader exposure than VEU, and it has a lot more securities than VEU. The choice is really up to you–VXUS gives you a broader exposure than VEA, since it includes both developed and emerging markets. 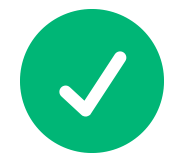 Our recommendation–invest in VXUS (vs. VGTSX) using a low-cost/no-cost brokerage (such as Robinhood or Vanguard for Vanguard funds). The tax efficiency for VXUS and VTIAX is very similar (around 0.87%). That means on average, your post-tax return is lower by 0.87% compared to the pre-tax return. Our recommendation–it’s a toss (and it depends on the brokerage you use and your dividend re-investment goals). The biggest question is in deciding between VXUS and SCHF is, what exposure do you seek to have–developed non-US markets, or both developed and emerging? If the former, then SCHF may be the right fit. If the latter, VXUS should be your choice. But be careful–do your diligence before investing in those funds. The Vanguard Total International Stock ETF (NASDAQ:VXUS) was unchanged in premarket trading Tuesday. Year-to-date, VXUS has gained 19.70%, versus a 11.90% rise in the benchmark S&P 500 index during the same period. 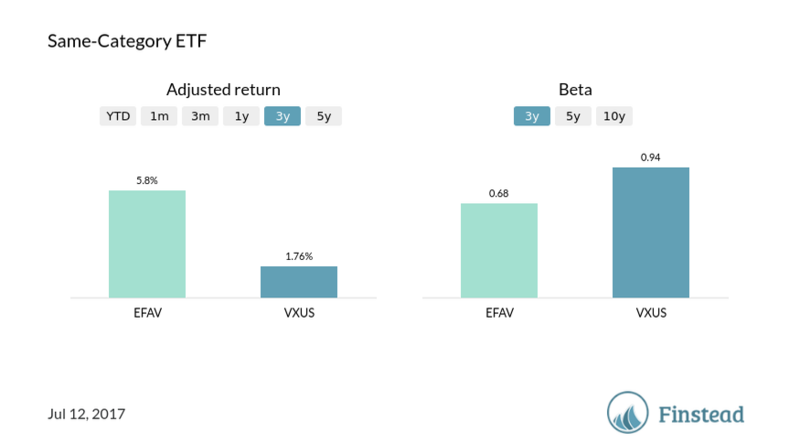 VXUS currently has an ETF Daily News SMART Grade of A (Strong Buy), and is ranked #5 of 53 ETFs in the Foreign Large Cap Blend ETFs category. This article is brought to you courtesy of Finstead.